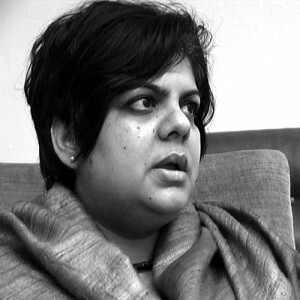 Sonia Khurana’s art practice centers around the poetics of inner experience, and the polemics of being in the world. Working equally with lens-based media, the moving image and with performance, she often stages encounters with spaces, cities and people. She continuously reconsiders the space of the political, played out through states of strangeness, alienation, displacement and embodiment. Through performative modes, she strive to engage with the constant struggle between body and language, to achieve a corporeal eloquence.She tends to draw critically on these concerns in ways that are often visually simple and understated. Using simple forms of social interaction, and proposing the material body as a medium of expression, Khurana’s practice engages with states of strangeness, alienation, and alteration, while offering a deliberately tangential discourse of power and powerlessness. She plays pilgrim, madwoman, renunciate, gypsy; looking at her parodic or elegiac self-images, one becomes aware of the artist’s own need to practice a nomadism of choice, a homelessness that mal-lingers, suggesting that she is destined to depart but never to arrive. Although she employs searing forms of self-exposure that generally suggest feminist unerpinnings(underpinnings ? ), Khurana proposes to leave behind an overdetermined feminist discourse on the body and self. Instead, working with an expanded understanding of subjectivity and desire, she proposes a kind of autographical trace of self-propelled liberation, which can be seen as a simultaneous discourse around (un)belonging; an allegory about dispossession that dismantles the norms of protected life. Sonia Khurana’s work has been shown in various biennales, notably the Aichi triennale [ongoing] , the Gwangju biennale2008, Pusan Biennale2004, and Liverpool bianniel2010. Select museum shows include Brooklyn Musuem, Fukouka Museum of Asian Art, Japan, New York, National Gallery of modern Art, Bombay, Asia Society New York, Museum of contemporary art, Brisbane, PlayHouse Durban, whitechapel gallery, London, Henie Onstad Kunssenter, Oslo, KusthalleWien, Vienna, House of World Cultures, Berlin, IVAM, [Valecia], etc. Ongoing participations include Pompidou Center, Paris, Aichi triennale, Nagoya, HeartHerning Museum, Denmark, Fotomuseum Winterthur, Zurich, British film institute, London. Sonia studied art in Delhi, and later at the royal college of art in London, and the Rijksakademie in Amsterdam. She lives in various cities around the world, and works mostly out off her laptop. She is based in New Delhi.